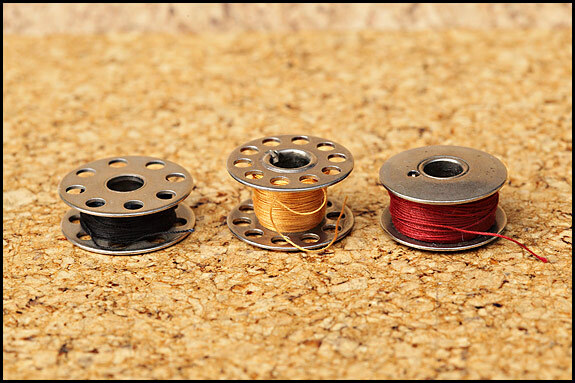 Which way round does the bobbin go in a vintage Singer? If it’s a long bobbin for a Vibrating Shuttle machine, it’s easy – you hold the shuttle with the pointed end down, and the bobbin drops into the top of it with the thread coming off from left to right across the front. If the thread’s coming off from the back of the bobbin, that’s wrong. It needs to be left to right, on your side. Yes, I know a picture would have been a great help there, but I forgot to take one. At this time of year I have to wait for a bit of sunshine in which to take a halfway-decent snap, and more often than not as soon as we get the slightest hint of a blue sky, Elsie drags me into the garden to be her assistant/labourer and by the time I get back inside, put the kettle on and remember there’s a picture I need to take, the sun’s gone in. If it’s a round bobbin machine, it depends on what model it is, and if you’re thinking to yourself “does it matter which way round I put the bobbin in?”, the answer is oh yes it does. 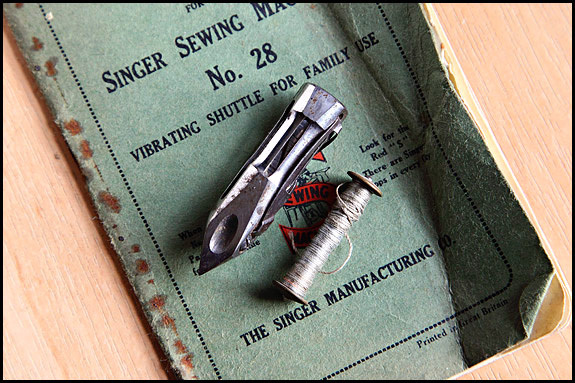 Now obviously this isn’t a problem if you only ever use one type of vintage Singer, because you’ll have read the book of words for it and know perfectly well which way round the bobbin goes in it. But what if you’ve just scrounged the lovely old 66K that Mrs Thing next door but one was about to take to the dump along with her weekly accumulation of empty gin bottles and copies of the Daily Mail and you can’t wait to see if it works? Or your friend Sally of the School Gate Gang’s got an old Singer which won’t sew properly and she’s asked if you’ll have a look at it for her if there’s coffee and cupcakes involved? Maybe you have a 99 and a 201 and every now and then you have a brainfart about the bobbins? Whatever, here’s how you tell which way round the bobbin goes in a pre-mid-1960’s Singer (and for all I know about the later machines, in one of them too). That’s a 66/99 bobbin case (they’re identical), and as you can see, the slot exits the case to the left, or to put it another way, anti-clockwise. And there’s that same bobbin case photographed from the same angle, now with a bobbin in it the right way round i.e. with the thread coming off it anti-clockwise. 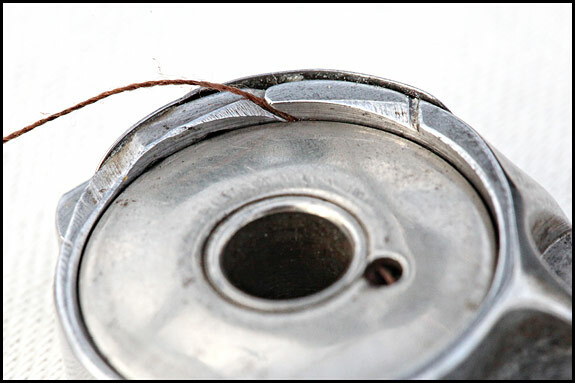 Yep, the thread comes off the bobbin the same way that the slot exits the case. Having got the bobbin in, your next step of course is to pull the thread to the right so it runs under the tension spring and into the notch, then pull it across the top of the bobbin and close your slide plate. 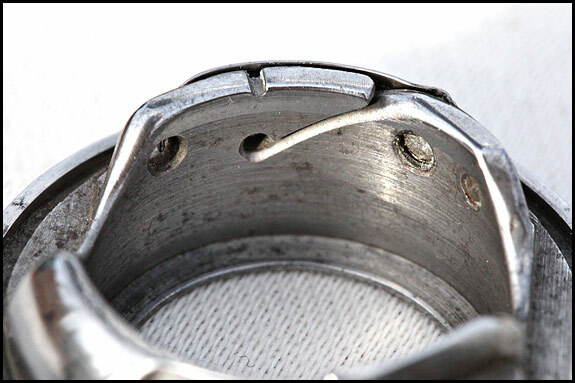 When you do that, you’re actually making sure that the thread leaves the bobbin through the hole at the bottom of the slot, then under the tension spring in exactly the right way for the spring to apply constant tension. Pulling on the thread pulls it down the slope of the slot, and ensures that it stays in the hole as it feeds off the bobbin. 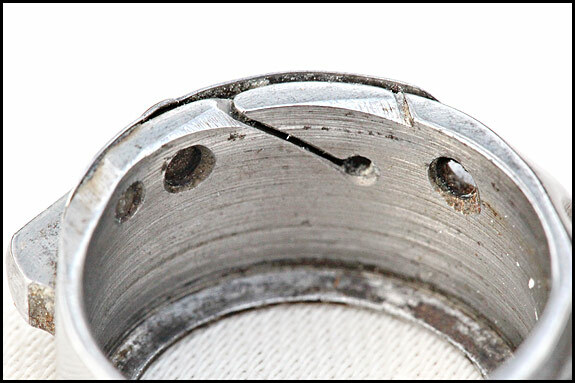 If your bobbin is in the wrong way round, pulling on the thread doesn’t necessarily slide it down the slot into the hole, so you may well get inconsistent bottom tension. 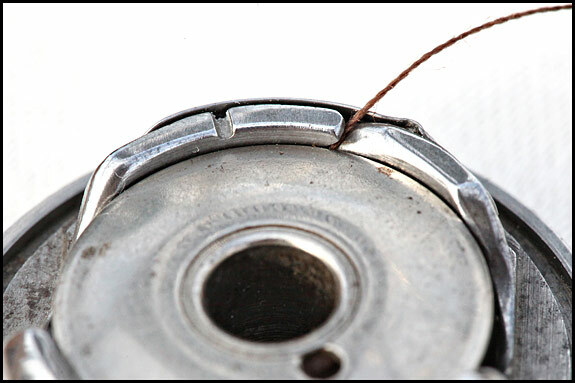 Now here we have the bobbin case out of a 201, and as you can see, the slot faces the other way i.e. it exits the case to the right, or clockwise. So which way does the thread need to leave the bobbin on a 201? Yep, that’s right. Clockwise. OK, I completely forgot to photograph a 15 bobbin case, but you can take it from me that it has a slot in it which provides exactly the same clue as to which way round the bobbin goes. Finally, just in case it hasn’t occurred to you, if you take this information together with what I’ve rabbitted on about in earlier posts, you now know how to put both the needle and the bobbin in any vintage Singer the right way round, as well as which way to thread the needle – and all this without an instruction book. 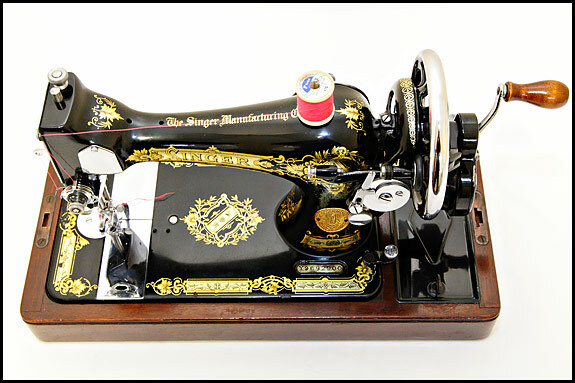 We don’t often have a vibrating shuttle machine in need of a good home, but I’ve just put this really pretty Singer 28K on the “Singers for Sale” page. 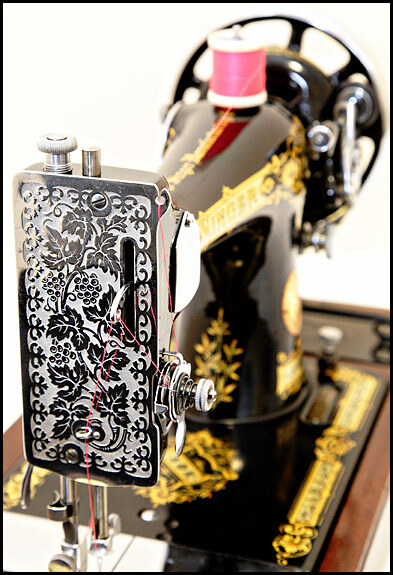 What’s interesting about it apart from anything else is its bobbin winder. As you can see, that’s a high-level one, so you could be excused for thinking that this machine is obviously a 128 so Sid’s had a brainfart again. But it’s not. It might have the high-level 128-style bobbin winder, but it doesn’t have the magic button on the shuttle carrier which ejects the shuttle, therefore it’s a 28. It could of course be a 128 which has had its shuttle carrier swopped for one off a 27 or 28, but it hasn’t. So it isn’t. A 128 that is. It’s a 28. For sure. The serial number says so. It’s a 1935 machine, from the last but one batch of 28K’s, which were almost but not quite 128K’s. First off, here’s a snap of a bobbin and shuttle out of a 28K. This is of course the Vibrating Shuttle that doesn’t, and this particular one is in the state most of them tend to be found in unless Granny looked after her machine really well and it’s been kept dry ever since she turned her toes up. There’s only one Singer long bobbin (as it is known), you can still get them from Singer, and they will fit any Singer Vibrating Shuttle machine. 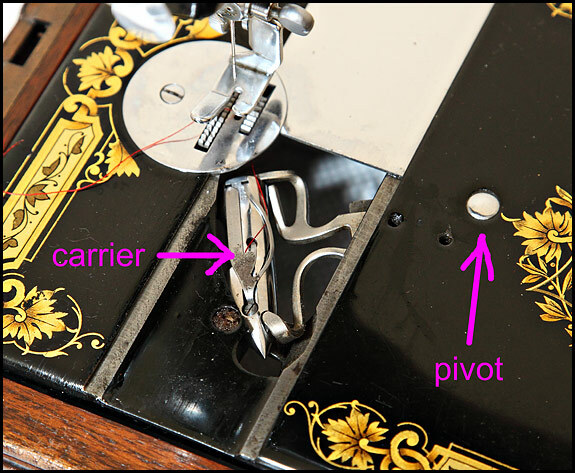 Now a plastic bobbin is all very well in your modern machine with a plastic bobbin-carrier, but it has no business in a vintage Singer. None whatsoever. Not even if it does fit on the bobbin-winder. You can get into your feng shui as much as you like, but believe me you’ll never up your positive qi if you put one of these in your lovely old 99. Not a chance. Guaranteed to put your chakras out of alignment too if you ask me. In fact, all things considered, the best thing you can do with any nasty plastic bobbins you find is to donate them to Auntie Sandra so she can use them in her nasty plastic Singer Touch ‘n’ Tangle. Having said that, though, you only want the one on the left if you have a 221 or 222 Featherweight or a 301. 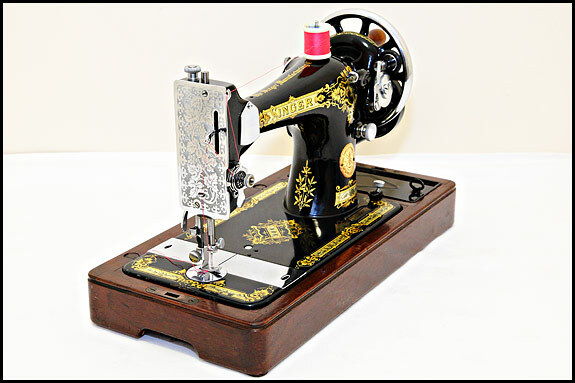 And if you have a Singer Model 15 of any flavour it’s the one in the midlle you want, although as far as I know, the 15 bobbin also fits stuff we don’t get into here such as the 223, 227, 228 and 237. 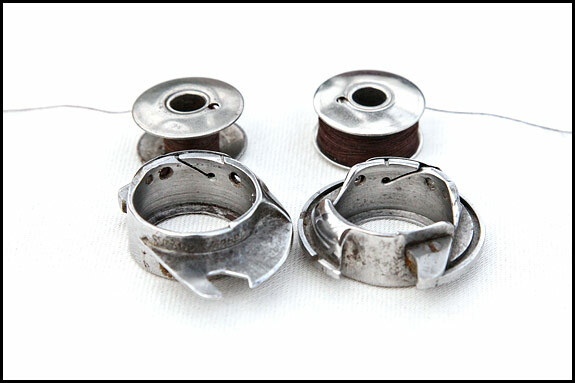 It’s the one on the right we’re interested in, and that one is properly known as the Metal Singer 66 Bobbin. It fits the 66, the 99 and the 201 which are the ones that Elsie and I mainly interested in, though I do have a weakness for a nice 185 and it fits those too. Actually it fits a whole heap of other machines as well such as the 285 and the 401, but that’s uncharted territory as far as I’m concerned. The one in the middle is the one for the 15’s, and it is flat. Yes, I know there’s a raised lip round the hole up the middle, but the top itself is flat. So is the bottom. Except there is no bottom, because a bobbin is eitherwayuppable. 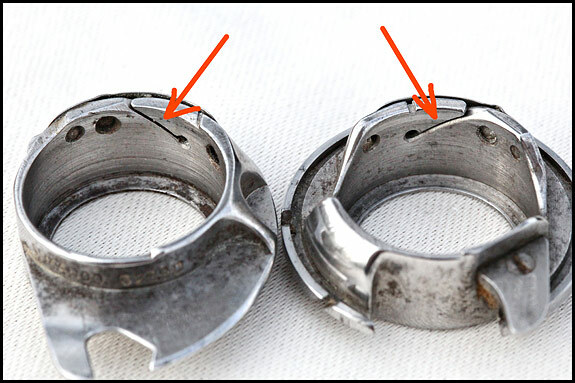 Check out the one on the right and there’s your answer – if the bobbin is slightly domed like that, it’s a 66 bobbin, whether it has holes in it or not. That’s the one you want for a 66, 99 or 201. I told you it was easy. However, we’re not quite done yet because you need to be aware of one final thing. We actually have two Singer sewing machines of the Vibrating Shuttle type in our little collection, and one of them’s the 1938 Model 28 hand-crank portable I got for Elsie earlier this year. The other’s a 1900 Model 27 treadle called Cleo, of which more when I work out a way of photographing her which doesn’t involve rearranging the sewing room. 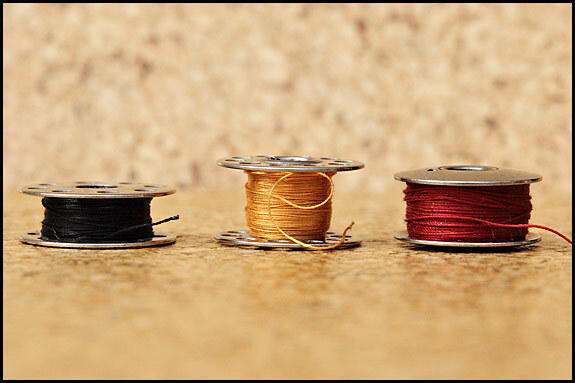 The shiny thing with the pointy end is the shuttle carrier, which contains the “long” bobbin, from which you might be able to see a red thread emerging. You take the carrier out to change the bobbin, and yes, it is a bit of a fiddle, but once you get the knack it’s easy and you can then allow yourself to feel rather smug about your bobbin-changing. 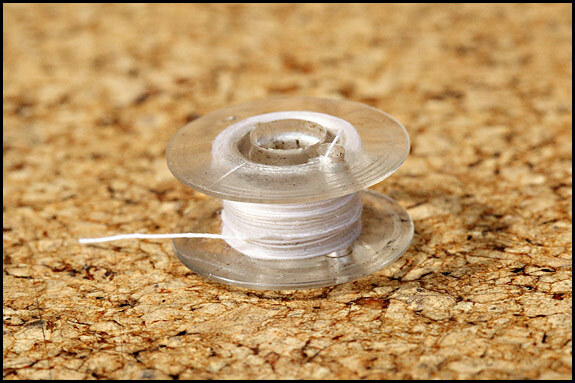 Actually, you can feel even more chuffed with yourself once you’ve mastered the art of getting the bobbin tension right on one of these, but I won’t go into that now. The curly metalwork to the right of the carrier in that picture forms the business end of the carrier arm, the other end of which is attached to a pivot under the bed capped by that chromed plug, so once you start sewing, the shuttle swings backwards and forwards in an arc from around 10 o’clock to 7 o’clock and back again, and it does what shuttles do.